The mind is like a parachute, it only works when it is open! History is always written by the victors !!! The more you investigate, the more you discover that we have been lied to by every institution on this planet. What makes you think that the religions are the one exception? They are at the bottom of all the evil and filth that goes on throughout this world. !!! 119 - Towers On The Moon ? 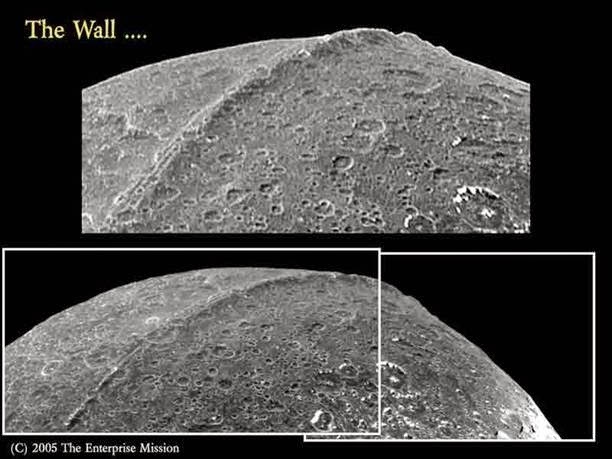 Wel, these pictures are of the moon Iapetus. A moon of Saturnus with a strange wall around the equator. There is much more evidence for artificial structures on our moon. I fear that because of religious intolerance there will come a third world war. And this time they will use atomic weapons in a way not seen before. Also there will be a lot of weapons most people never heard of. Like EMP weapons, and H.A.A.R.P. It is all so ridiculous when you realize we are not alone in the universe. They will make a war, so terrible, so horrible, people will say, "This never again, we must heve a global gouvernment so individual countries with a crazy leader, or conquering ideas, can no longer threaten the World Peace. A world where people can say and tell about what they can scientificaly proof. A world where every child has the right and duty to go to school, wheater they are boy or girl. We underestimate the islamic brainwash they endure. Their Imams (priests) portray the West and America as the great satan. We are "The infidels that must be converted or killed". How can we tollerate this kind of message being preached in mosks throughout Europe and England. For mere than 500 years we have been fighting for our right to scientificaly proof the statements of religion wrong! First we had to fight the ingnorant christian religion! And now in the 21th century we have to fear an attack on our life if you dare to speak out against islam. Remenber how they killed Theo van Gogh in Amsterdam. Remember how I.S. recently killed 15 bound prisoners by cutting their throaths. It is disgusting!!! They are selling people on the slavemarket, for crying out loud. I heard about a Jezidi girl who was sold for € 137,- In what times do we live??? Like I said DISGUSTING! And they dare to call themselves religous? You people are a disgrace. Murder in name of religion is NEVER justified. Not for Jewes, not for Christians, and not for Muslims.